Do you decorate for Halloween? I do a little bit and each year I add a few more Halloween decorations to my collection. I always love walking around the neighbourhood on Halloween night and checking out all the houses and yards done up…sometimes very elaborately too! It seems to really help set the mood for the scariest night of the year. Today John and I headed out to The Home Depot for some craft supplies for a fall craft (thanks to The Home Depot Pinterest) that I’m making this weekend and discovered all the neat Halloween decorations they sell there. When we walked in, the employee greeting us at the door told us where they were located, but we could see them almost right away. 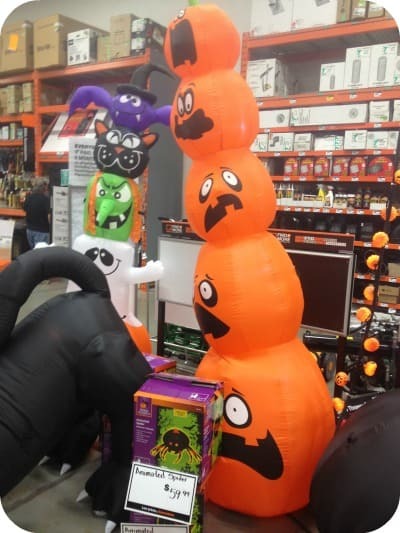 The Halloween Inflatables (aka Halloween in a box) were the first ones we saw because you really cannot miss these! They were big! I snapped a couple pictures of a few of them that were on display. Our front yard is just a lawn with no character so putting one of these inflatables there would really make our home stand out for the trick or treaters. I like that they are easy to use with no mess. 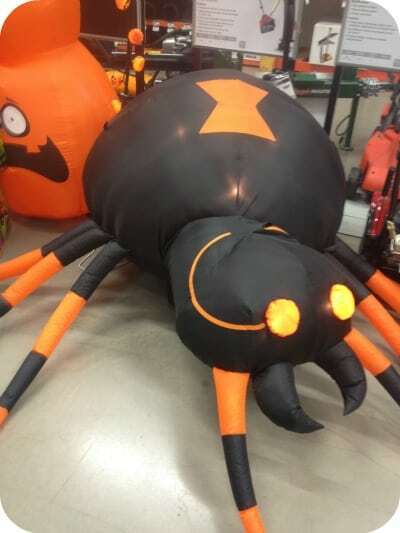 They are priced at $59.97 for the Animated Inflatables, $39.97 for the 4ft Inflatables and $39.97 for the Large Inflatables. We hang Christmas lights, but I would have never thought to hang Halloween lights! 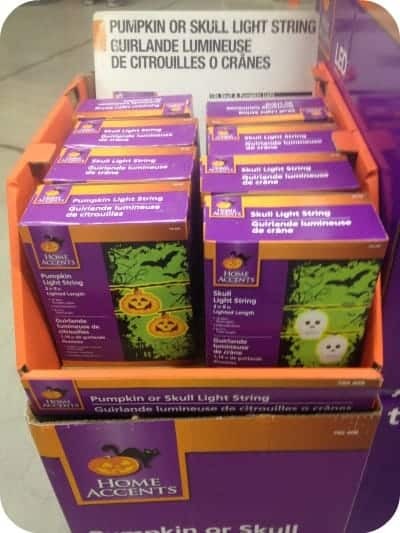 In their Eerie Electrical section, I saw these Pumpkin and Skull Light Strings that would be perfect to give a scary glow to our front porch. You could also use them to decorate your house for a Halloween party. They also sell Strobe Lights that you could use as a scary special effect for the partygoers/trick or treaters. As for prices, the Decorative 10ct Lightset is $7.88, Basic Light Set 50ct is $7.88 and Strobe Lights are $4.98. Very affordable! If skulls and spiders are too creepy and you want to still get into the Halloween spirit, you can buy some of their seasonal stands. In our store, these were located right at the entrance so I didn’t have a chance to snap a picture of them. They have a Scarecrow Mum Stand (ARV $18.83), 6’ Scarecrows (ARV $9.42) and Halloween Yard Stakes 36” and 42” (ARV $8.82). These Halloween products will available for a limited time this fall at The Home Depot stores across Canada and online at www.homedepot.ca. I’ll likely pick up one of the inflatables (maybe two!). I encourage you to check out The Home Depot’s selection of Halloween products on your next visit and see what fits with your Halloween decor. I never really got into decorating for Halloween other than window decals and a pumpkin but The Home Depot looks like it has a great selection of decorations. I’ve never thought to go to Home Depot for my Halloween decorations, so thanks. Never knew they had decorations. Didn’t know they had this, but I don’t have enough money for good groceries and would rather make decorations. Wow! I hadn’t thought about the Home Depot for decorating. I love that cat inflatable! It looks like they have some different things and ideas for Halloween decorating. Good tips and ideas. I am always amazed at how many goodies for the home that Home Depot gets in each season. I love browsing the aisles, but secretly I’m plotting which items I want to to try to get on sale after the holiday is over if I run out of decorating money before then! 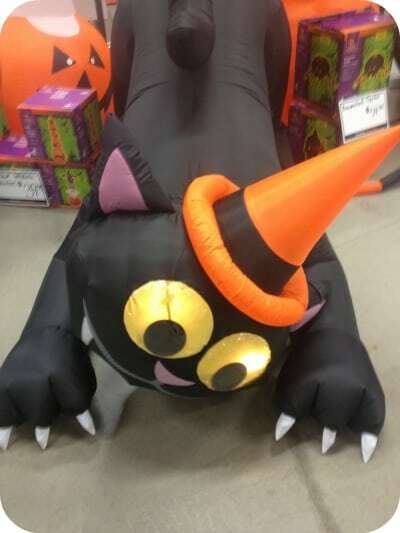 I love halloween, but cant fall in love with the inflatable stuff. I’ll have to check that out. I didn’t even know the Home Depot had Halloween decorations! We’ve been back and forth to Home Depot a few times trying to perfect our decorating! Halloween is my favorite time of year. Today I am shopping for decorations, so this post was very very helpful. I am heading to home depot to pick up some Pumpkin and Skull Light Strings. I have been to Home Depot twice this week! Got bolts, washers, and nuts for a Montessori activity for homeschooling my 3 yo the first time, and their kids day today for building a fire truck! They only had a small halloween display, think I must have missed all the good stuff, all the xmas stuff is up alrady! I hate that! I love Halloween! I Don’t Shop At The Home Depot Very Often But I Like Their Halloween Decorations. I’ll Have To Go Check Them Out Now That I Have Seen What’s Available. I never would have thought to go there looking for Halloween decorations. We did not go all out with decorating this year (normally convert the front half of our garage into a display) as we are busy purging stuff and looking for houses. But I guarantee once buy a house we will be decorating again so trip to HD will be in order. And I just followed them on Pinterest! Inflatables seem to be popular.